The real adventures of Jonny Quest and Pinocchio! Who knew March was going to turn into an absolute blitz for new to DVD and highly anticipated Blu-ray Disc titles? We’re still catching up from earlier in the month, with several reviews for major titles coming up over the next few days, but we have a couple of biggies for you to start the week. Our Hanna-Barbera nut Randall Cyrenne clocked in over the weekend to write up his thoughts on The Real Adventures Of Jonny Quest: Season One, Volume One, the 1990s updating of one of the 1960s most iconic animated action adventure shows. Usually I pick a couple of quotes from my colleagues’ reviews when summing them up here on the front page, but really you should just go read for yourselves: even for those who wouldn’t count themselves as fans this is a vastly in-depth coverage of the show’s production hiccups and the episodes in this set. However, is it any good? “Yes”, says Rand, “This a flawed show but when it’s good, it’s very good”. Secondly today is my long promised full review of the Pinocchio: Platinum Edition on Blu-ray and DVD. As usual with these releases, I wanted to give the disc a fair but thorough trial and so though it’s been a while in coming I hope you’ll appreciate that a review of this length doesn’t write itself (if only, and, yes, I did wish upon a star)! 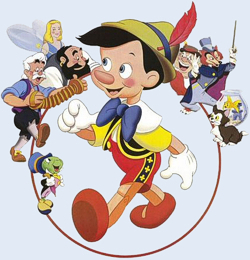 The word “masterpiece” is banded about all too easily these days – not least by Disney’s own marketing department – but if any of Walt’s original classics really deserve the accolade it’s Pinocchio, for all the reasons mentioned in the review. As always, a spring Platinum release comes as light as ever, with a good deal of perfectly suitable material missed out from yet another “definitive” edition, though a very big hand goes to the Cine-Explore feature and, on the DVD, the exemplary audio commentary. Even for regular DVD users, if you’re a serious Disney fan the Blu-ray is the way to go if only for Cine-Explore, but if my review still fails to persuade you, we’re concurrently launching our first Blu-ray giveaway, for Pinocchio itself! So hi-diddle your way to our Contest Corner for a chance to win the complete set in high definition – a no strings attached opportunity that ends next Tuesday 7 April at 11:59pm ET. And if that’s still not enough Pinocchio for you, don’t forget to catch up on Jeremie Noyer’s fascinating musical history of the film right here! Back soon with much, much more, including James’ take on Monsters Vs. Aliens…so stay tooned! — Ben.